1 of 1 Heat oven to 425 degrees . 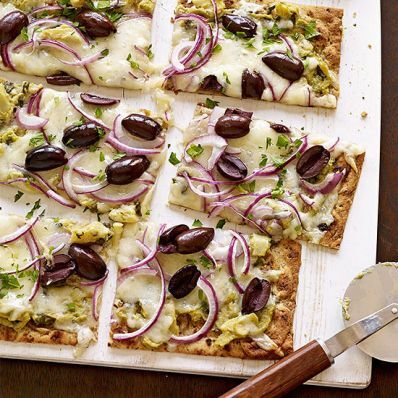 Spread artichoke tapenade onto flatbreads. Top with cheese, Kalamata olives and red onion. Transfer to baking sheets and bake at 425 degrees for 10 minutes. Carefully slide flatbreads from sheets directly to oven racks and bake at 425 degrees for an additional 3 minutes, until crisp. Sprinkle with parsley and cut each square into 6 pieces.